<!-Eric Gill. 1882-1940--> Eric Gill. Virgin and Child. Virgin and Child. 1931. Wood engraving. Physick 827. 5 3/4 x 2 3/4 (sheet 8 1/16 x 3 7/16). Proof printed on simili-Japan paper with one side deckle edge. Unsigned. $275. Another signed proof printed on white wove paper. Initialed, dated and annotated 'Greetings from Eric and Mary Gill' in pencil. $975. Virgin and Child. 1938. Wood engraving. Physick 980. 5 1/8 x 3 1/2 (sheet 7 1/2 x 5). 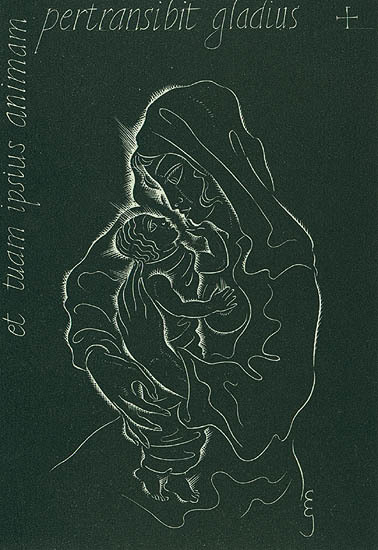 Printed on hand-made laid paper as a Christmas card. 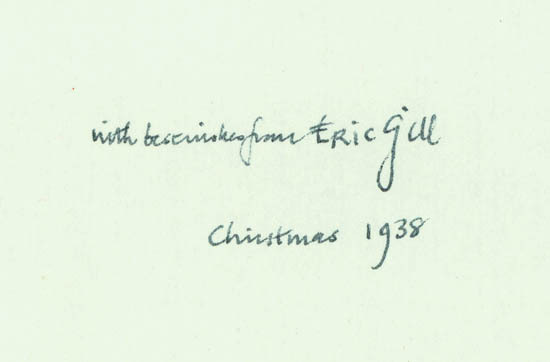 Signed, dated, and annotated in ink on the inside leaf, 'with best wishes from Eric Gill christmas 1938.' An extremely scarce personal card. Initialed and annotated 'et tuam ipsius animam pertransibit gladius' in the block. $950.